Technology is woven into pretty much every element of our society. We all carry devices in our pockets that give us access to the majority of all human knowledge and a fair proportion of the current population. Our phones help us organise our lives, and in some cases are beginning to replace parts of them. But what does this mean for the future? Will these helpful gadgets continue to be our aides, or are we actually being slowly outmoded? 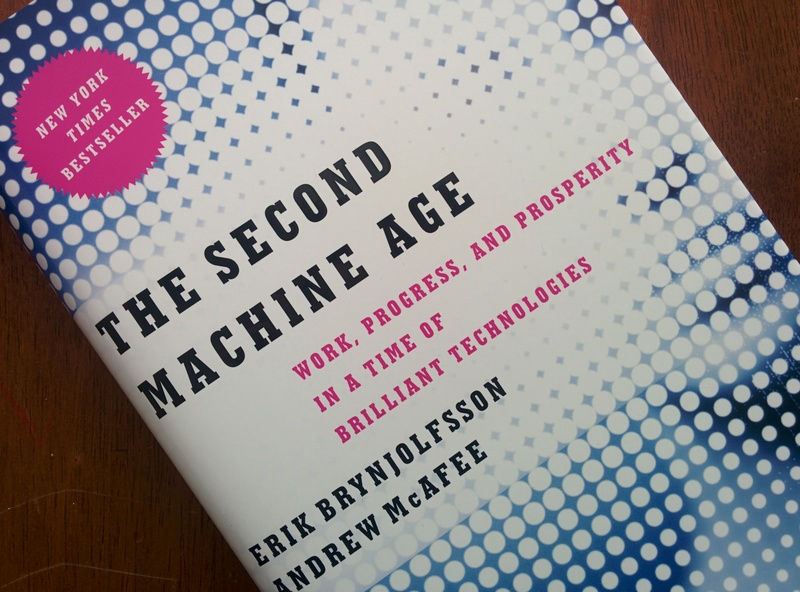 In the Second Machine Age, authors Erik Brynjolfsson and Andrew McAfee explore the impact that technology will have on the economy and workplace in the coming years…and in many ways it isn’t good news. Both Brynjolfsson and McAfee hail from the MIT Centre for Digital Business, which gives them an impressive amount of insight to the emergent technologies that are transforming the way we live and ply our trades. At the start of the book they outline three principles which are creating this new landscape. The first is the incredible rate at which technology is improving its power and software capabilities. The second is the continued digitisation of knowledge and products, and the third is how most new innovations are actually recombined elements of previous ideas. In isolation any of these principles might just be seen as an interesting outlier, but when they combine it paints a picture where many jobs, and entire professions, could soon become replaceable by cheap, efficient, software AI or robots. In fact, in some cases, that’s already begun. Now, we’ve all heard these types of stories before in the pages of science fiction novels, but what makes the Second Machine Age so fascinating is the amount of study that the authors have done into the socio-economic factors that are currently at play in the modern world. In fact the middle section of the books does get a little bogged down in economic theory, making the reading a little hard going at times, but it never descends into text book territory. The ideas put forward are clearly argued, backed with data, and make a lot of sense. The authors look at innovations such as Waze, the mapping app that employs the locations of its users to gauge how fast traffic is moving at any given time, and show how it is an example of the three principles. Self driving cars and intelligent computers are also explored, with discussions over how they will benefit people while also potentially threatening their livelihoods. Baxter, the cheap, programmable manufacturing robot is another example of the way repetitive, manual work will be done before too long. It all mounts up to a sea change in what we should expect the workplace to look like in the not so distant years ahead. Now I’ve been interested in this subject for some time. Last year I wrote an article for PC Advisor magazine here in the UK called ‘The Future of Robots‘ which explored many of the themes covered in this book. While it still remains a fascinating area, I have to admit that as a ‘knowledge worker’ in his early forties, the Second Machine Age is quite a scary book. On several different occasions I had my career flash before my eyes. Navigating the future does look like it will be tricky, and the luddite fear of the oncoming computer overlords is given plenty of fuel in this tome. That’s not to say though that this is some kind of techo-horror attack on the brave new world. In the closing chapters the authors lay out various ideas for how this could all be a very positive thing, and the potential growth of new employment sectors and trades. They even suggest areas you should look towards to avoid being retired by machine in a few years from now. In many ways it’s a Pandora’s box style book, one that releases many terrifying things into your mind, but at least contains hope. You might not strictly enjoy the Second Machine Age, but a few years from now you could be very glad that you read it.